We have successfully boarded in ourselves and laid claim to an insignificant planet in an insignificant outer region of an unremarkable spiral galaxy, Milky Way, with long arms winding towards the bright central bulge. Instead of searching for absolute truth or any nonsense of that sort we have resorted to a plastic rationalization for the reason of our existence. 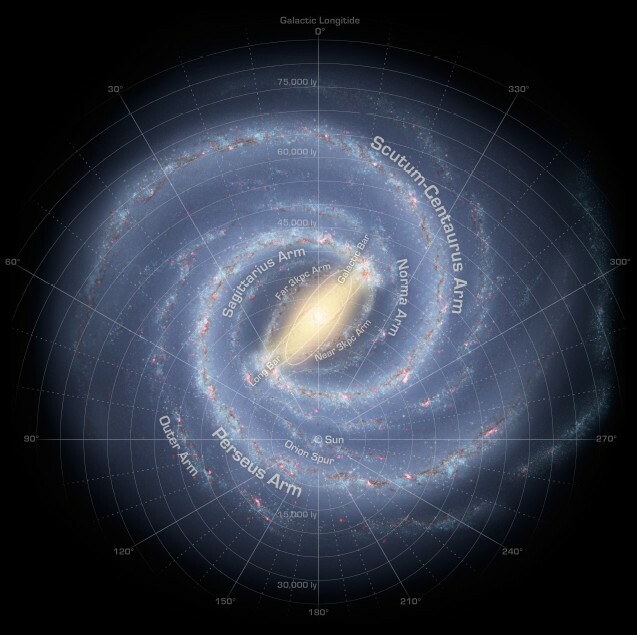 The Sun’s location is indicated, along with various arms of Milky Way galaxy. The study points out that six major extinction events have occurred on planet Earth till now, or to put in humbly, been discernible as of yet. Our present global civilization is driven by the 7-day work week, and millions in currency denomination bears more relevance compared to a time-scale of million years. The fickle human brain has not been programmed to comprehend cosmic time-scales. But what needs to be understood is that the present civilization came to be because at particular points in history there have been periods where flora and fauna have flourished. We, the present human race is a result of mammals taking over a planet without an apex species. A vastly overlooked fact is that our Universe is pretty much indifferent to everything – both inanimate and animate life – the tables can be turned on an apex species in the blink of an eye. Coming back to the published article, speculations have been abound ever since these extinction events have been detected on what caused it. Even more mystifying was the fact pertaining to how life flourished abundantly for long periods following these extinctions only to be massacred later on in the orbit around Milky Way. This new study states that the Sun revolves around the Milky Way at 26.3 km s-1 kpc-1 which happens to be at a differential increment of 11 km s-1 kpc-1 when compared to arms of our galaxy. Our solar system moves faster than Milky Way’s lethargic arms, cutting its way across life sustaining as well as hazardous regions of the galaxy. Sun’s orbit cutting across Milky Way’s arms. The Sun moves faster than the arms of our galaxy. 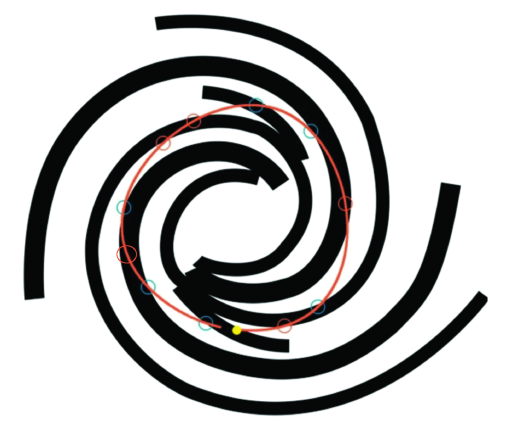 The circled points are extinction events. Just as the scriptures and religious diktats proclaim rebirth an essential ingredient for human spiritual development, our cosmic home is no stranger to this concept. We are but mere vessels, rolling and clanking about, crashing into each other, awaiting to be emptied and refilled, just like our planet.